The ozonator is a device with an aerator at the end of its hose, which is inserted in the water, oil or food. 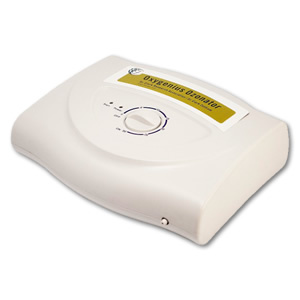 It adds a tiny amount of ozone and results in a sanitizing and oxidizing effect. Ozone is produced by adding a third atom of oxygen to a molecule, i.e. O3 instead of the usual O2. Kills bacteria and viruses in food and beverages with surprising speed. Has a strong penetrating effect, sanitizing and oxidizing everything. While ozonating food and beverages, it turns into oxygen and water, leaving no toxicity behind. Place food in a plastic bag. Insert ozonator hose and close the plastic bag. The packaging of the food should be open to allow the ozone to enter. After turning off the ozonator, the packages and containers should be closed again. Ozonation continues, on its own, for about 10 more minutes, even while refrigerated. Excess ozone flavor can be blown away as the food is warmed later. Estrogens in dairy products (estrone, estriole and estradiol) and food containing phenolic substances can be destroyed in 15 minutes. General sterilization of food takes 7 minutes. To remove dyes including chlorine takes 10 to 20 minutes. Ozonate water for 5 minutes – 1 glass a day – drink within 20 seconds. 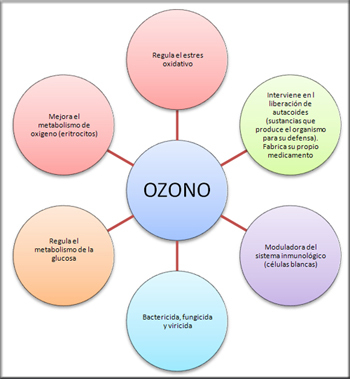 Ozonized water has an oxidizing effect and can remove many invaders, including the streptococcus bacteria for pain. To remove freon, drink one to three glasses a day. It mobilizes the Freon in your body toward the liver and renders it capable of detoxification. Ozonized olive oil binds the toxins in your body in order to allow expulsion. Take vitamin E, 400 IU once daily to counteract the temporarily over-oxidation. Take it 5 or more hours after the ozonized oil. Ozonize olive oil for 30 minutes. It lasts 5 days in the refrigerator otherwise store in freezer. ¼ cup twice a week helps with other methods for the removal of PCBs. 1 Tbsp. taken morning and night for two weeks removes tapeworm larvae and sheltered ascaris eggs. It can destroy viruses that are already inside the cell’s chromosomes, latent viruses such as herpes. * Do not ozonate supplements, medicines or herbs. * It does not remove metals. * Do not take ozonated oil as freely as if it were a supplement. The ozonation could become excessive.